Fishing on Lake Erie is as old as the first Eriez Indian to set foot on the sandy shores of Presque Isle. The Eriez used log canoes and harvested the fish with spears and basket-traps. Early European settlers to the region were amazed by the abundance of fish and this promped explorer Samuel de Champlain to call the Great Lakes "the Sweet Sea" in 1615. Hook and line served as the preferred method of fishing for nearly two hundred years until commercial operations began catching herring in the bay with the weighted nets. 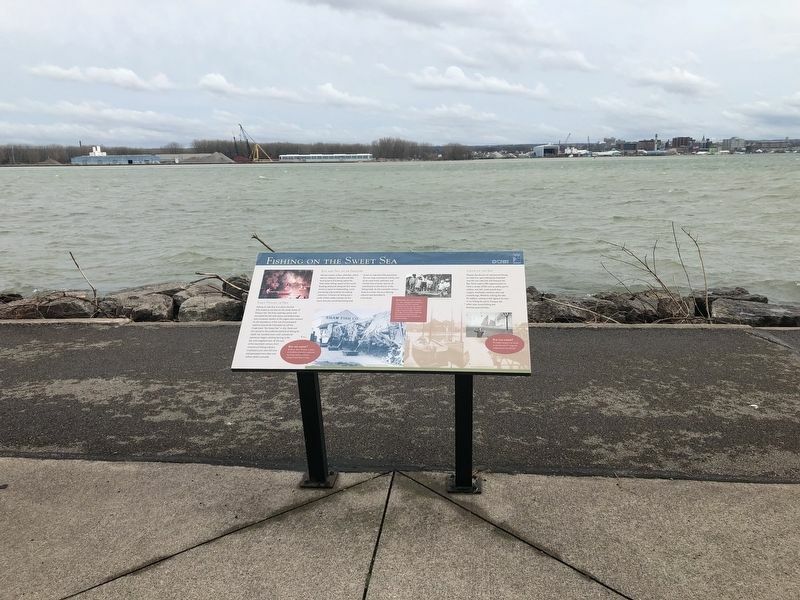 At the turn of the twentieth century, Erie's commercial fishing industry employed 3,500 men full time and generated more than one million dollars annually. Lake Erie's fish population. The non-stop commercial activity, lack of set catch limits, pollution and introduction of exotic species all contributed to the demise of the fishing trade. As the twentieth century drew to a close, the once thriving industry had dwindled to a few boats. 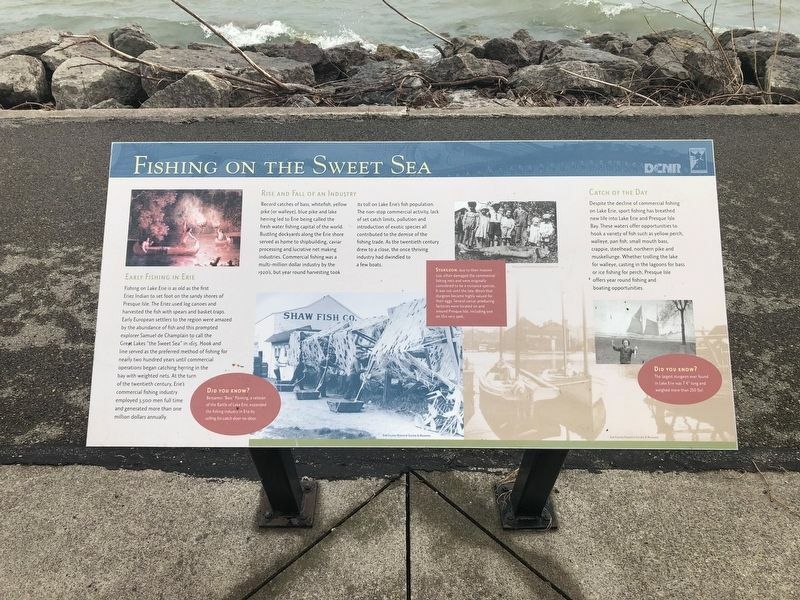 Despite the decline of commercial fishing on Lake erie, sport fishing was breathed new life into Lake Erie and Presque Isle Bay. These waters offer opportunities to hook a variety of fish such as yellow perch, walleye, pan fish, small mouth bass, crappie, steelhead, northern pike and muskellunge. Whether trolling the lake for walleye, casting in the lagoons for bass or ice fishing for perch, Presque Isle offers year round fishing and boating opportunities. Benjamin "Bass" Fleming, a veteran of the Battle of Lake Erie, expanded the fishing industry in Erie by selling his catch door-to-door. Sturgeon, due to their massive size, often damaged the commercial fishing nets and were originally considered to be a nuisance species. It was not until the late 1800's that sturgeon became highly valued for their eggs. Several caviar-producing factories were located on and around Presque Isle, including one on this very spot. The largest sturgeon ever found in Lake Erie was 7'4" long and weighed more than 250 lbs! Location. 42° 9.259′ N, 80° 5.384′ W. Marker is near Erie, Pennsylvania, in Erie County. Marker can be reached from Thompson Drive north of Fisher Drive, on the right when traveling north. Touch for map. Marker is in this post office area: Erie PA 16507, United States of America. Touch for directions. Other nearby markers. At least 8 other markers are within walking distance of this marker. Erie's Industrial Explosion (within shouting distance of this marker); Son of the Sea (within shouting distance of this marker); From the Bay to the Battle (within shouting distance of this marker); Tribute to a Hero (within shouting distance of this marker); Perry Monument: A Beacon of the Community (within shouting distance of this marker); Commodore Oliver Hazard Perry Monument (about 300 feet away, measured in a direct line); Preparing For Battle (about 300 feet away); A Climate For War (about 300 feet away). Touch for a list and map of all markers in Erie. More. Search the internet for Fishing on the Sweet Sea.